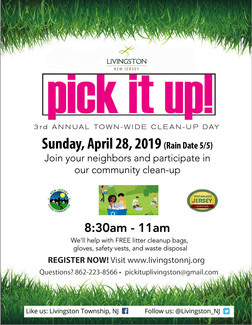 The Township of Livingston will be holding its' third annual community clean up on April 28, 2019 (rain date May 5). This is town-wide clean up of all garbage and litter that has gathered at select locations around Livingston. Residents are encouraged to sign up online with a team or as individuals and choose one designated clean-up area. Location Team Leaders will advise volunteers on additional details and provide supplies. We look forward to making this annual event that is fun for all while at the same time helping to keep our beautiful town looking the way it is meant to be- clean, green and garbage-free! Each participating volunteer must complete the form below. Cleanup bags, gloves, and safety vests will be provided. Minors must be accompanied by a parent/guardian while cleaning up at all designated locations. Parking instructions for each location will be provided when available. Street Clean-Up Locations. VOLUNTEERS, sign up here. 3, 2 kids under 13.